Emperor Takakura was infatuated with the beautiful Kogō no Tsubone, who served his wife, Empress Kenreimonin. Kenreimonin felt if Kogō had a son by her husband the child could be a risk to the throne. The empress gave orders to poison Kogō, so she ran away. The emperor was so upset that he ordered that Kogō be found. 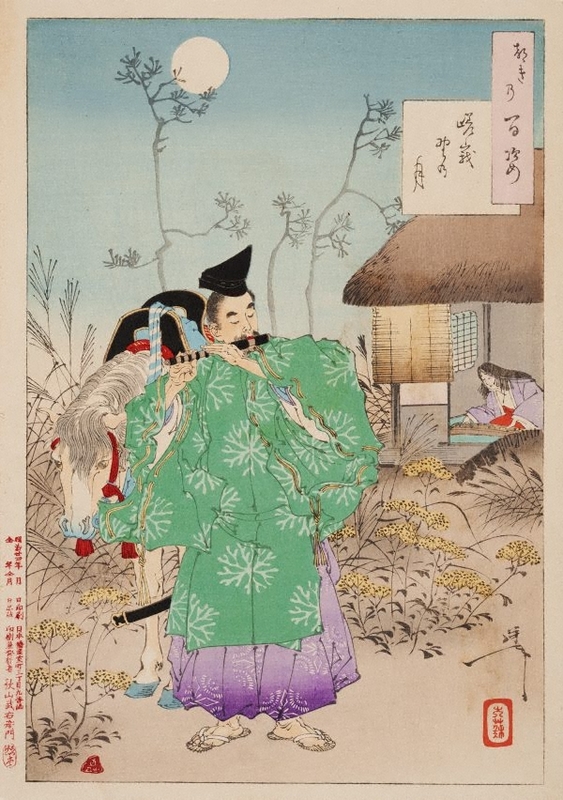 The courtier and flute player Nakakuni, who had performed with Kogō – a brilliant ‘koto’ (zither) player – rode on his horse around the countryside looking for her. Here, in this bright moonlit scene, Nakakuni is playing the song 'Sōfuren' (‘love for the husband’) on his flute. He finds her as she responds to his tune on her 'koto'. She ultimately returned to the emperor, had a child that was a girl, and was sent away to become a nun.